The following information is taken from the book, Medicine and Surgery of South American Camelids (Llama, Alpaca, Vicuna, Guanaco) by Dr. Murray E. Fowler. The first chapter, as well as other sections, of this book deals with general biology and evolution of camelids, and thus touches on camels, their Old World “cousins”. The one-humped camel (Camelus dromedarius ) is found in the Arabian deserts, while the two-humped camel (Camelus bactrianus ) is an Asiatic animal. Despite some major differences in size, all of the camelids are basically similar in structure. Because camelids evolved in a semi-desert environment, they have developed sophisticated physiological adaptations for coping with both heat and dehydration. All camelids have a complex, 3-compartment stomach. Although they are not considered ruminants, they do regurgitate and rechew ingested for age. In fact, they are more efficient at feed conversion than are ruminants in extracting protein and energy from poor quality forages. All of the camelids evolved in North America. Although the ancestors of the lamas and camels appear to have diverged sometime in the Eocene epoch, they weren’t completely separated from each other until the Pleistocene, when the ancestors of the camels migrated across the Bering Strait (temporary) land bridge to Asia. Lamas migrated to South America, and all camelids died out in North America. Once in Asia, camels migrated through eastern Europe, the Middle East and North Africa. It is thought that the dromedary may have evolved from the Bactrian camel. However the hump(s) may have been acquired as a result of domestication. Wild camels became extinct in North Africa before historic times (3000 B.C. ), leaving only the domesticated stock. However, in the case of the Bactrian camel, there are a small number of animals (300 – 700) located in a small area in the Trans-Altai Gobi Desert, that are considered a wild population. Domesticated Bactrian camels were found in southern Russia by 1700 – 1200 B.C. and even in western Siberia by the 10th century B. C. They were used in China as early as 300 B.C. 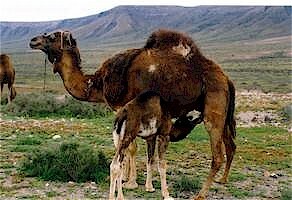 as the original “silk route” camels, but were replaced by crossbreeds of the Bactrian/dromedary (Tulus)later on. These camels were domesticated even earlier than the Bactrians, before 3000 B.C. in the Arabian peninsula. The term “dromedary” is derived from the dromos (Greek for “road”) and thus is directly applicable only to the racing or riding dromedary. However, the term is used throughout the world to describe this species. Dromedaries were first associated with nomadic Semitic cultures and did not become important until the rise of the Arabian culture. They became important domestic animals only with the Moslem conquests of Egypt in the 7th to 11th centuries A.D. This camel does not store water any more than does any other species, yet ¡t does not need to drink water for days. It can handle extreme dehydration as a result of a number of different physiological adaptations. Camels have been known to lose safely body water equivalent to 40% of its body weight, a loss that would be lethal in any other animal. How do they do this? Plasma volume is maintained at the expense of tissue fluid, so that circulation is not impaired. 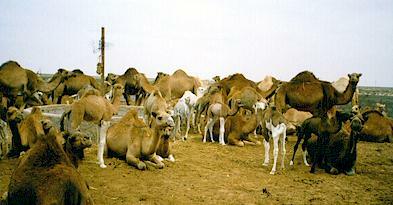 The small oval erythrocyte of the camel can continue to circulate in situations of increased blood viscosity. Their kidneys are capable of concentrating their urine markedly to reduce water loss. The urine can become as thick as syrup and have twice the salt content of sea water. They can extract water from their faecal pellets so much that these can be used immediately for fuel upon voiding. A further adaptation solely for heat is involved in the camel’s ability to have a large fluctuation in body temperature (from 97.7 – 107.6 degrees F). During the day, its body acts as a heat sink, and during the cool night of the desert, excess body heat is dissipated by conduction.